In its first three rounds of funding, Fund for Shared Insight’s Listen4Good (L4G) initiative supported 46 nonprofits across the country in gathering feedback from the people they serve using the L4G feedback process and semi-standard survey instrument. Central to the survey is the Net Promoter System, a set of questions originally developed in the private sector to gain insights about the customer experience. 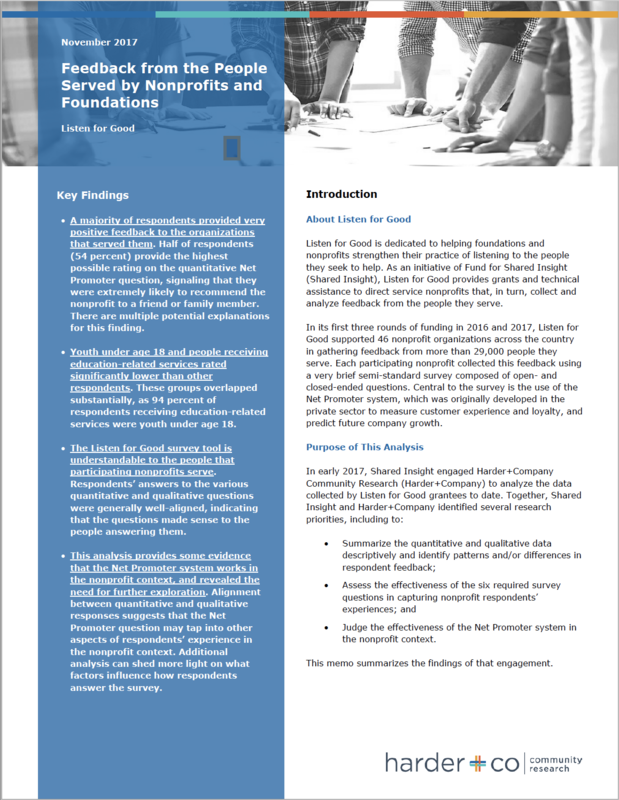 In early 2017, Shared Insight engaged Harder+Company Community Research to analyze the L4G surveys’ aggregate dataset, consisting of more than 29,000 responses; summarize the data and identify patterns and/or differences in respondent feedback; and assess the effectiveness and utility of the Net Promoter System overall and specifically in the nonprofit context.